Innovative DVD with Travis Dorsch! Now you can learn sport specific training exercises designed for kickers and punters! Create "your own" personal workout program! Develop strength, power and leg speed and learn how to maintain it! Learn how to prepare for gameday! Perform at your optimum level! 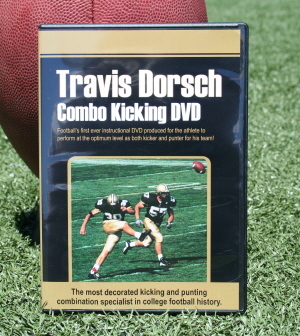 In 2001 while playing for Purdue University, Travis Dorsch became the most decorated kicking and punting combination specialist in college football history. He received first team All America honors at both positions and has the distinction of being the only player in NCAA history to be a finalist for all three of the prestigious postseason awards given to special team players -- the Lou Groza (for outstanding kicker), Mosi Tatupu (for outstanding special teams players) and Ray Guy (four outstanding punter)...winning the Ray Guy Award. As a kicking specialist, he became the only player in conference history to earn first-team All-Big Ten honors as both a place kicker and punter...He holds the Big Ten Conference career records with 355 points scored and 68 field goals made. His 151 PATs broke the school's all-time record and ranks fifth in conference annals. He also became the first kicker in conference history to earn Big Ten Player of the Week honor four times in the same season... His field goal percentage of 81.48% set a school season-record...His power and hang time on kickoffs minimized any type of return and he even propelled 16 kicks that sailed out of the end zone! As a punting specialist, his 48.47-yard punting average lead the nation and set a school season-record...It aslo ranked second on the Big Ten's season-record chart and was recorded as the fourth-highest in NCAA Division I-A history...he also owns four of the five best punting performances in school history. And if honors from the football field were not enough, he also garnered national academic accolades by being named Academic All American! Our videos and DVD’s are extremely rare instructional programs that include exclusive footage of professional athletes and coaches demonstrating and teaching desired sports skills. Each production is designed to provide the viewer a unique opportunity to view specific movements of kicking, punting and snapping through an analysis perspective. This will allow precise techniques to be viewed over and over again through stop-action analysis as well as through simply viewing each program in its entirety. Since these videos and DVD’s are created for the niche market of kicking, punting and long snapping they are produced in low volumes. This in turn adds a much higher demand and value of each program purchased. More importantly, every production is designed for each viewer to “learn to coach oneself.” This will enable a tremendous learning opportunity for every viewer to develop self-reliance through self-teaching strategies.